Following the official launch of Rittal’s new VX25 large enclosure system at last year’s Hanover Trade Fair, Rittal South Africa unveiled this evolution during a customer day which took place last year. After five years of development work, the VX25 is an enclosure system that has been fully developed to meet the requirements for increased productivity in control and switchgear manufacturing, and along the Industry 4.0 value chains. With the ‘System Perfection’ slogan, Rittal offers a major innovative leap, made possible through depth of experience and intensive customer dialogue. The VX25 offers high quality, reduced complexity and easy assembly. The uptake has been exceptional and the range has gone on to include a Blue e+ version, which offers revolutionary energy efficiency thanks to hybrid technology. 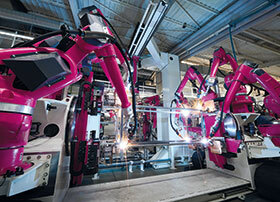 Intensive dialogue with Rittal customers was crucial in developing the new large enclosure system. During a large-scale, scientifically-based usability study, researchers used words, images and moving film to document the everyday working life of control and switchgear manufacturers, covering ten companies in Germany, eight in the US and six in China, including small, medium-sized and large companies. As a result, 150 systematically recorded and specific requirements for a new enclosure emerged, providing developers and product managers with a robust guide for the actual development work. The development culminated in the new VX25 large enclosure system where the name stands for the versatility of options, the fulfilment of customer requirements and for perfect symmetry through a consistent 25 mm pitch pattern. The VX25 matches the way the control and switchgear manufacturer thinks and works – both in functionality and processes. The heart of the innovation is the newly-developed frame section. It determines the installation space, the efficiency in engineering and assembly, the expansion options, the stability and thus the reliability and flexibility in the customer’s workshop. With the new enclosure system, it is possible to maintain all the important and established product features of the existing TS 8 range and to expand them significantly with a multitude of new functions and customer benefits. More than 25 registered patent and trademark applications demonstrate the high level of innovation in the VX25.